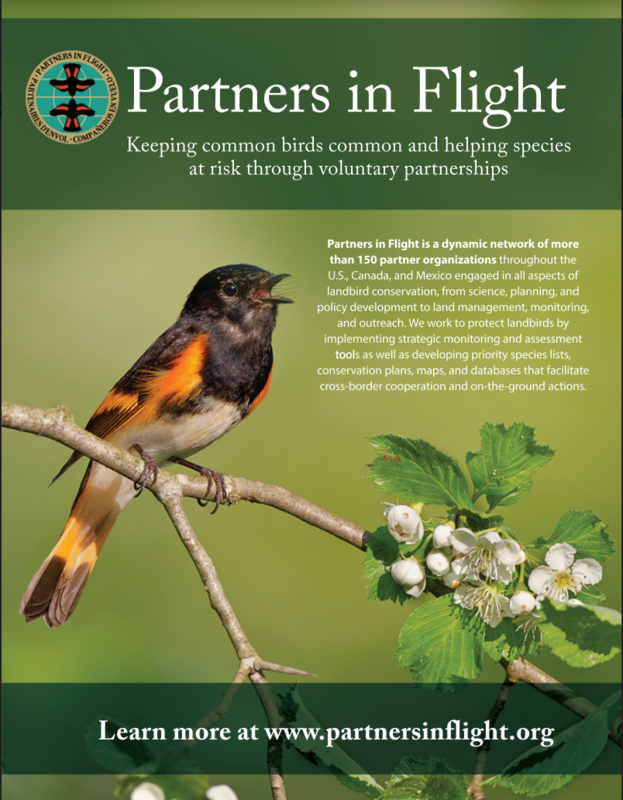 Partners in Flight (PIF) is an initiative of conservationists working to keep common birds common and help species at risk through voluntary partnerships. Across large landscapes, the juxtaposition of public and private lands is among the most important components of conservation – knowing the management objectives of each and how they can complement each other by providing different habitats over time can lead to healthy landscapes for birds and people. Products from industrial and non-industrial private land management such as timber, crops, cattle or tourism often drive local economies, and strong local economies can drive conservation of birds and habitats. “Expanding Partnerships” was the theme of our annual Fall PIF Steering Committee meeting held in October 2018. 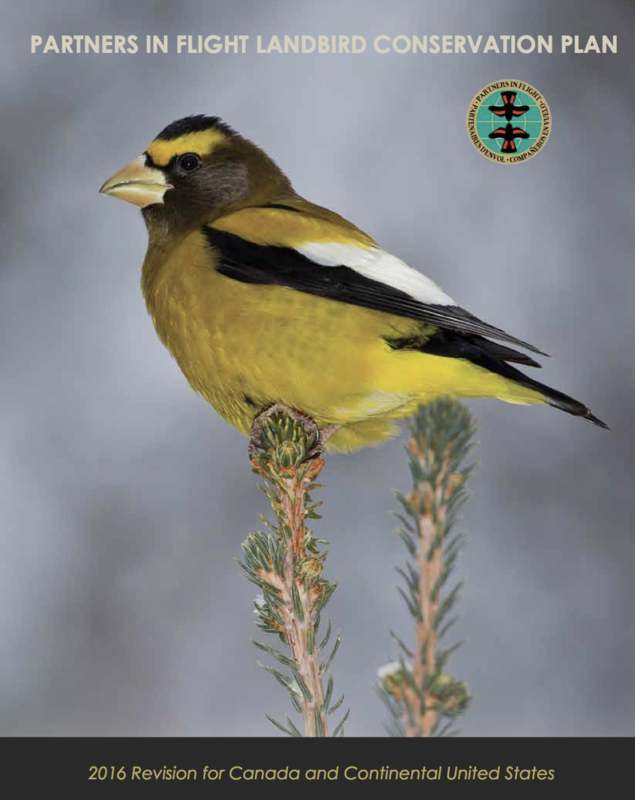 Meeting in Roscommon, Michigan we asked “What can we do as the PIF Steering Committee to add value to local and regional conservation efforts and to engage new partners in our PIF network?” The answer we heard from Michigan partners – Kirtland’s Warbler conservation. Specifically, PIF can provide a neutral and science-based forum for partners to convene and discuss furthering ongoing voluntary conservation actions, bringing new partners together, and working toward delisting of this species. This answer is directly in line with our PIF mission. The PIF Steering Committee hosted a one day meeting of about 30 people – several representatives of the Kirtland’s Warbler Conservation Team, 8 industries or industry groups, and a variety of others to bring partners involved in KIWA projects together for updates and exploration of action items to further assist in the delisting and conservation efforts. The industry partners had the chance to explore shared priorities and challenges, which will be translated into opportunities for continuing discussions to find win-win solutions to help the economic and conservation sides of the Kirtland’s Warbler equation. 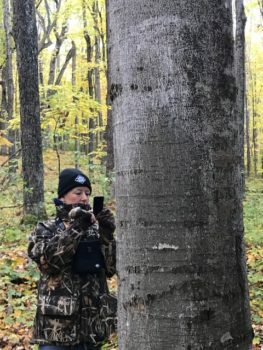 Meeting topics included management of habitats and the marketability of jack pine for public and private lands, the science needs for Kirtland’s Warblers and jack pine management, and the need for joint communication and outreach effort around the species recovery. The day ended with a field trip to Kirtland’s Warbler habitat and discuss the various approaches currently used to manage it. 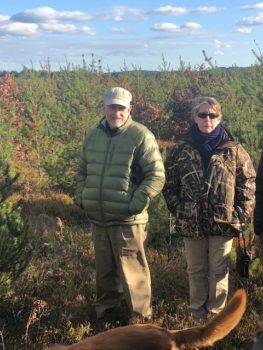 Tom Will and Sara Schweitzer in Jack Pine – Kirtland’s Warbler nesting habitat. During our business sessions, we also made progress advancing several ongoing PIF priorities, including grasslands bird conservation, the establishment of an Eastern Working Group for PIF, Science team priorities, and integrating better with Joint Ventures and others. Dave Ewert of American Bird Conservancy led our group on a field trip to visit old growth forest at Hartwick Pine State Park. We then toured the Weyerhaeuser oriented-strand board mill in Grayling. We had a great discussion on forest stewardship and how Weyerhaeuser promotes best management practices with independent foresters through certification programs. A few local biologists joined us for the business sessions and provided valuable input while learning how PIF operates. The meeting proved to be a great success. It provided added-value to an important local/regional conservation and economic issue and we engaged new non-traditional partners in the PIF network. The Steering Committee plans to use our fall meeting each year in the same vein – host a day for local and regional partners, make an effort to add value to ongoing conservation efforts, and engage new partners at a grassroots level.